A powerful letter for teachers is HERE. to help you. A great letter for Bus Drivers is HERE. Feel free to copy and pass on to those working to help the student. What Do We do with this Student in Class? Specific interventions for classrooms that have students struggling with RAD Reactive Attachment Disorder are all in this powerful DVD set developed by Nancy Thomas and School Counselor, Julie Mendenhall. The effective tools to turn a classroom from chaos to calm are here for only $36. Click HERE for yours! Traditional class interventions fail with RAD students. 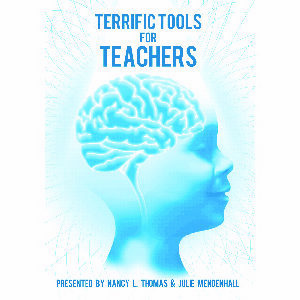 Find out what works in Terrific Tools for Teachers! Do You Want More Training for you School Staff? You can bring Nancy to your school for a full training so your entire staff is prepared and skilled at working with students with RAD and are Trauma Informed. Nancy brings it to a training with an in depth understanding of the problem and the specialized techniques to be successful and make a difference in their lives while regaining control of class and teachers’ sanity! Click HERE for more information to bring an unforgettable training to you! Do You Want More Hands on Training? We offer professional skill building opportunities to educators that want more tools to help challenging students. Our camps offer two days of intensive training and a full week of experiential skill building. If you want to boost your success in class we can help you do it! There is no fee. Check out the dates and locations HERE and call our office at 970 984 2222 or email admin@attachment.org to save your space.